Newspapers should rent out or sell building space to a historical foundation and let them turn the newsroom into a local museum, library or public forum. Create a vibrant, interactive museum about the city. Blend together news and history, photo and video. Newspapers are virtual time machines, but their secrets are locked away in microfiche. No sense in having a central newsroom when the news is always “out there”. 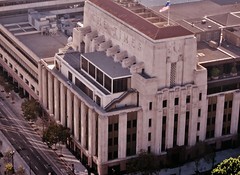 A city news agency should consist of dozens of bureaus, scattered geographically throughout the city, with mobile offices. Budget meetings could held virtually with Skype or something like it. A small production shop could produce the print edition, which is transmitted to printing presses and delivered freely in each community. News organizations are often painted “liberal” and “conservative” for good reason — usually because their editorial boards are generally left- or right-leaning. Sometimes this stigma carries over into characterizing news coverage, warranted or not. Some of our nation’s earliest newspapers were, in fact, political newspapers established and funded (often by government subsidy) to further the interests of the party. Even in the last few two-newspaper towns, one paper was generally regarded conservative, the other liberal. So, we shouldn’t be surprised then when the Pew Research Center’s Project for Excellence in Journalism discovers that about 44 percent of the nation’s new non-profit news agencies have a clear ideological leaning and along with that, an unclear source of funding. Those non-profits actually producing original, non-partisan coverage were generally more transparent in how they were funded. See the Texas Tribune, for example. The Internet has merely given fertile ground for a new crop of partisan publications. The low cost of entry will ensure a healthy run of ideologically driven “news” agencies, but none of them will be a singular replacement for the moderate, generalist palate of ideas that the newspaper was. And that’s OK — we are gradually moving into a world where news consumers are creating their own palate of news sources on tablets and mobile devices and RSS readers. To help educate us news consumers, Pew provides a few criteria to use to gauge a site’s journalistic worthiness. I’d like to see those applied to some mainstream media! Sure, the consumer must always be on guard. But for the non-profit news industry to mature, publications must adopt transparency and contextual clues to help readers ascertain whether what they are reading is information or whether it is opinion, or whether the news organization is at all concerned with producing new information in the first place. This basic virtue helped bring good journalism out of the murky depths of the partisan press and into real public service. Your typical metropolitan newspaper was like a good breakfast: an assortment of information nutrition to get you started for the day. You got a mix of local, state, national and international stories — the fruit, meat and fiber you need to be reasonably informed and clear-minded about the state of the world that morning. But you might nibble on some celebrity gossip, sample a society or lifestyle column, scan the sports box scores, picking up all the information that interests you, plus some incidental information that gets absorbed along the way. If you were to consume the paper in its entirety, you would no doubt be a well-rounded, informed individual — at least for a day. Needless to say, one-third of US adults say they eat breakfast regularly. About the same proportion consumes newspapers reguarly. I wouldn’t go far as to say one caused the other but surely they correlate in some way — but it is awfully interesting to observe. 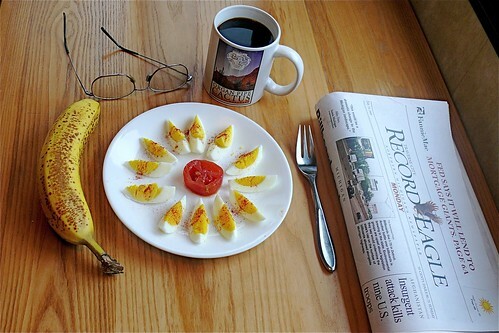 In many households, eating a nice breakfast is likely reserved for the weekends, as is perusing a good newspaper or magazine. And so, it’s not hard to imagine more newspaper subscriptions becoming weekend-only. Nowadays, it’s much preferable for working-class people to check their laptops or smartphones whilst nibbling toast and sipping their morning coffee. The newspaper simply has no place at the kitchen table. And just in case you’re wondering, this won’t be the last time I compare newspapers and media to food.